The MaxiMatic EPC-807 8-Quart Digital Pressure Cooker is perfectly suited for all of your different meal plans. With six multifunctions and eleven functions altogether including rice & risotto, potatoes & yams, meat & chicken, beans & grains, soup & stew, keep warm, and even a browning feature (activated by pressing the start button and then Keep Warm/Cancel when the meat has sufficiently browned) the programmable MaxiMatic EPC-807 electric pressure cooker is most definitely one of the fastest and most efficient ways for you to get a balanced meal. With the capability for vegetables, meat, legumes, and carbohydrates, this electric pressure cooker encourages a healthy lifestyle and will adapt to your every need. 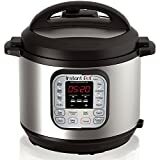 Typically you can find this pressure cooker with a retail price (see lowest price) around $100. The MaxiMatic EPC-807’s delay timer can be programmed up to nine hours ahead, meaning a late change in your schedule won’t be reflected by a further wait when you get home and have to make your meal from scratch. Even with meat, the browning feature means that you don’t have to cook the meat in a separate pan and have the hassle of transferring hot meat from the lip of a larger pan into a smaller pot. Plus you save on washing up. The meat will brown before you finish the rest of your meal and then you can set it to cook. All the food preparation you have to do can be done quickly in the morning so that you can come home to your already cooked meal after a long hard day at work. The warming feature means that your dinner won’t go cold before you get to it. The automatic keep warm feature lasts up to twelve hours after the cooking process has completed. There’s no risk of your food going cold before you can open the lid. If you’re still not convinced, the MaxiMatic EPC-807’s sensitive, secure, smart technology detects the pressure cooking time and pressure automatically for you. This is the automatic pressure cooking feature, and it means you don’t have to spend your time calculating; however, there is still an option for you to program up to ninety-nine minutes of cooking time by hand as well. I’ve had my MaxiMatic EPC-807 for just over a year now, and so far, I don’t think I’ve ever had a more reliable kitchen appliance except maybe for my fridge. I haven’t had a single part that doesn’t work, and it hasn’t stopped working at optimal levels and hasn’t slowed down. Everything’s still running in top shape one year later. I personally love the variety of functions offered by the MaxiMatic EPC-807. It encourages me to eat healthy and balanced meals due to its capability to cook meat, carbohydrates, legumes, and vegetables. I never feel short on energy or guilty for eating things that I shouldn’t as I am eating what I should, and even when I don’t, hey – all things in moderation right? I’ve made numerous meals in this pressure cooker over this past year, and every single one has come out in an ideal condition. Whether I’ve been cooking just for myself, for my family or my extended family, the eight-quart capacity was a very big help. The MaxiMatic EPC-807 has come through for me time and time again, and I couldn’t be happier with it if I tried. With the MaxiMatic EPC-807 Pressure Cooker, you’re always kept in the loop when the reliable kitchen aid has finished its job. It has a very indicative beep at the end of each single cooking cycle, so you can turn your attention elsewhere while the efficient electrical machine takes care of things for you. The Maximatic EPC-807 is prepared for (mostly) unforeseeable events too with an automatic resumption of the cooking process after a sudden loss of power. So, your documents probably didn’t save in time, but at the very least your dinner will be. 7 PROGRAMMABLE CYCLES include Brown / Sauté; Rice & Risotto; Meat & Chicken; Potatoes & Yams; Soup & Stew; Beans & Grains; Keep Warm. Automatic Pressure Cooking. It saves a lot of awkward calculations from checking what I see in my recipe book to what’s on the internet, to the rough guide my friend gave me about what times work with hers and to another recipe book. With this neat little feature, I don’t have to work out a single thing which is fantastic as the MaxiMatic EPC-807 gets it bang on every time. Automatic Keep Warm. I’m notorious for letting myself get carried away with anything and everything-walking, reading, talking, working and so on-so I could not be more pleased with the Automatic Keep Warm feature. If I forget to take the food out, my MaxiMatic EPC-807 keeps it warm for me, so I don’t ruin anyone else’s meal. 6 Multifunctions. I have mentioned this before, but this variety is what prevents me from having to worry about what pan I will need for such and such meal. My electric pressure cooker means that I have a suitable kitchen tool for every food group I can think of. You just have to go onto the internet to find out how to boil or steam your vegetables. It costs less than $95! Yep, an “Elite Platinum” pressure cooker costs less than $100. The MaxiMatic EPC-807 gives you all of these wonderful features at a fifth of the price than some mobile phones–insanity! The MaxiMatic EPC-807 just hits the spot for us. It isn’t the best built pressure cooker, and it lacks some features – but it comes in at a great price. It’s a must have pressure cooker model for the not-so-serious pressure fanatics. Click here to see what other customers are saying about the MaxiMatic EPC-807.. Even with the few cons we have found, the MaxiMatic EPC-807 still just hits the spot for us. It isn’t the best-built pressure cooker, and it lacks some features, but it comes in at a great price when you shop around. It’s a must have pressure cooker model for the not-so-serious pressure fanatics. The features it does have still allows it to stand apart from others and the safety features and resumption features make this well worth the money and will fit nicely into your kitchen routine. Click here to see what other customers are saying about the MaxiMatic EPC-807. The MaxiMatic EPC-807 includes an easily detachable eight-quart cooking pot so it can be fully submerged in soapy water for a more thorough cleaning. However, that probably won’t even be a problem with the non-stick coating on the pot. It is also completed by a brushed stainless steel finish making the MaxiMatic EPC-807 look as attractive as the food it cooks for you. This particular canner from MaxiMatic is a very sturdy and reliable kitchen aid that provides me with quality meals that leave me feeling good about myself and my lifestyle time and time again. It is even useful after a power outage-although I haven’t experienced that one myself. How many microwaves do you know of that have the ability to do that? The MaxiMatic EPC-807 is a superb pressure cooker that delivers exceptional cooking quality. A well-built and durable canner that will last for years to come. I’ve been reading so many comments on places like Amazon and am beginning to wonder if any of those reviews actually come from real people or company hacks. One complaint I’ve read several times was about the non-stick coating on this machine peeling off after a couple of uses. Is this even remotely true? Have you heard of any complaints from REAL people about this machine. I really want to get an electric pressure cooker and have no idea who to trust. After using my MaxiMatic EPC-807 a few times, the inner pot’s non-stick coating is missing in spots and comes off easily and I have only used a wood spoon in it. That means what is already missing from the 2 or 3 uses ended up in my food and I consumed it!! I can’t use it in this condition! What recourse do I have?? I would contact the manufacturer. They should replace it for you. Or if you bought it on Amazon, I’d return it. I have the 8qt Elite, today I got the 4qt Elite. The 4qt is perfectly quiet, my 8qt makes a little noise and constantly lets out a little steam from the valve but seems to cook just fine. Is it normal that the bigger one is noisy? I had never used a pressure cooker so thought they were just that way until I used the small completely quite one. Hey Amy, no it should be completely quiet. I would stop using the 8qt…sounds like there is something wrong with it to me. You may want to troubleshoot the problem. I have had my pressure cooker for almost 2 years now and it works perfectly. The non-stick has not peeled off yet and the trick is to use a wooden or plastic spoon to stir. You can now get a lot of silicone coated cooking utensils so it will save your non stick from peeling. I have this particular model and I love it. However, if you are not familiar with using a pressure cooker it may take some time to get used to using it. My mom taught me how to use the stove top type so it was easy for me to adapt to using the electric one.